Take a cast of 10 living historians. Have them tackle a 40-plus kilometre trail through the rugged Cariboo Mountains. Pit them against narrow alpine paths, mosquito-infested swamps and an extreme climate where one minute you’re trudging through snow, the next, blazing sun – all while using nothing but 19th Century gold rush-era equipment. 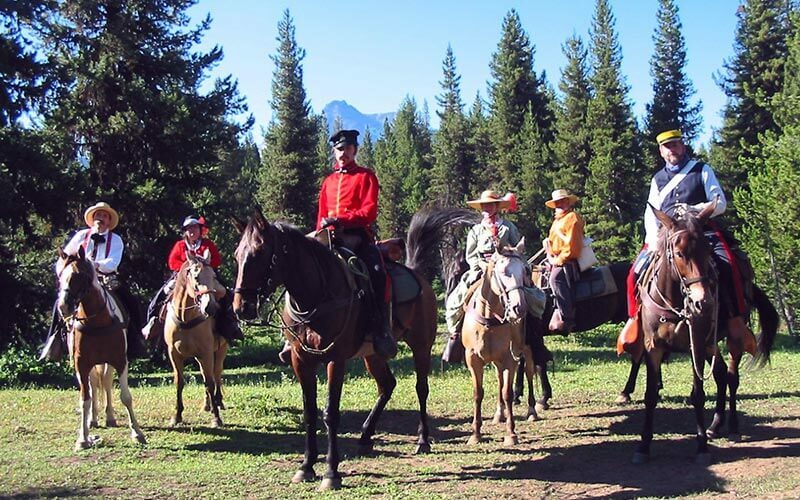 Welcome to the 1861 Gold Rush Pack Trail Ride, a rollicking recreation of the opening chapter of the Cariboo Gold Rush. On August 3, 10 members of the R.E. Living History Group (RELHG) assemble at the Weaver Creek Trailhead in Keithley Creek and embark on their historic quest. The gear, food and clothing they’ll use during the three-day ride are period-authentic, right down to the mosquito repellent. The RELHG will discover whether rosemary oil or a First Nations plantain-based ointment is more effective. Peppan has already discovered what doesn’t work. “The Skeeters at Fort Langley are bad this year. Frankincense oil doesn’t stop them,” she said. The RELHG is an informal group of history enthusiasts dedicated to keeping alive the memory of Colonel Moody’s Columbia Detachment of Royal Engineers, sent to the Crown Colony of B.C. on its founding in 1858. Using period clothing and equipment, they bring B.C.’s Colonial era to life. The 1861 Gold Rush Pack Trail Ride party has attracted an eclectic mix of living historians from as far away as Edinburgh. They include a restaurateur, a registered nurse and a carpenter as well as an actor and an historic interpreter. The adventures of Peppan and her fellow living historians will be recorded by JPS Media Works of Vancouver, producers of the popular “Simon Sees” series of travel videos. And the expedition will also be able to post to their own “Tracebook” pages in real time even while they’re in the remote Cariboo Mountains. “Tracebook uses purpose-built Facebook fan pages as a launching pad for on-line historical interpretation,” said Barkerville’s Visitor Experiences Manager James Douglas. “Historical ‘characters’ can comment on their daily activities, interact with each other through wall posts, and provide links to information about their lives. Tracebook is a heritage-minded social media initiative jointly sponsored by Barkerville Historic Town and the New Pathways to Gold Society (NPTGS). The daily posts to Tracebook will give insight to life during the Cariboo Gold Rush. Douglas admits the RELHG will make one more concession to the modern era: placing geocaches along the route. This will allow GPS enthusiasts to follow in their footsteps. The new caches will be added to the NPTGS Chasing the Golden Butterfly Heritage Trails Route. The 1861 Gold Rush Pack Trail Ride is a partnership between NPTGS, Barkerville Historic Town, RELHG, Aboriginal Tourism B.C. and the District of Wells. The trail was restored by the Friends of Barkerville and winds through forest and meadows and upwards to Falconer Summit. From there is continues to French Snowshoe Mountain, which offers spectacular views of the Cariboo Mountains. It continues on to Yanks Peak Road, the Snowshoe Plateau eventually to Chumley Summit. It then winds down to the boggy Sawmill Flats, along to the crossing of Antler Creek. It follows the creek until it reaches the junction with the Grouse Creek Trail. A boggy slog take you to MacCallum’s Gulch, then the last leg along Williams Creek to Richfield Courthouse and the gateway to Barkerville.